Retired Auxiliary Bishop Robert Morneau of Green Bay has requested and has been granted a withdrawal from all public ministry. In a letter dated Sept. 14 and addressed to Bishop David Ricken, the head of the diocese, Bishop Morneau stated that he failed to report to authorities an incident of priest sexual abuse of a minor in 1979. In a separate letter, Bishop Ricken acknowledged the request. 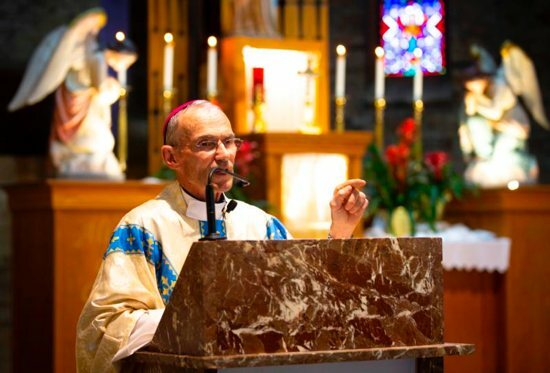 “In light of the public revelations of abuse in the church and the call for more accountability on the part of bishops, Bishop Morneau feels great remorse over the fact that this same priest went on to abuse several other minors,” wrote Bishop Ricken. “He wants to right himself with God and the people of God. “I have now officially granted his request to ‘withdraw from public ministry,’ since his retirement was already accepted by the Holy See in 2013, at the required age of 75,” the bishop said. “Bishop Morneau is a good and faithful man who did what he felt was right at the time, realizing now that he could have and should have done more to protect the innocent,” added Bishop Ricken. The incident which Bishop Morneau oversaw took place in 1979, the year he was ordained a bishop. It related to David Boyea, who was ordained in 1973. Boyea pleaded guilty to first-degree sexual assault of a child and was sentenced to 10 years in prison in 1985. He was permanently removed from the priesthood in 1990. Additionally, a civil case against the Diocese of Green Bay and Bishop Morneau in Brown County Circuit Court by three of Boyea’s subsequent victims in 1986 was settled on undisclosed terms. Bishop Morneau’s admission of failing to report an incident of clergy sexual abuse was the second such case in Wisconsin in September. On Sept. 4, Jesuit Father Robert Wild, former president of Marquette University, asked the Milwaukee Jesuit university to remove his name from a new residence hall. Father Wild’s case dates back to his role as provincial superior of the Chicago province of the Society of Jesus from 1985 to 1991. “During my six years in office, accusations of sexual abuse of minors were lodged against three of our members,” he said in a letter to Marquette University’s president, Michael Lovell, and the school’s board of directors. One of the Jesuits who was disciplined by Father Wild went on to abuse again. Lucero is news and information manager for The Compass, newspaper of the Diocese of Green Bay.